Every year new writers gain visibility, and indeed credibility, by way of screenwriting contests. But every year it seems there’s a wider range of screenwriting contests to choose from. Knowing which are worth their salt can be tricky! One of the main things worth considering when preparing to submit your script is whether or not the competition will help increase industry awareness in your work. That is ultimately the end game after all – getting your work read by the gatekeepers of the green light. Do they have well known Judges, Production Companies and/or Agents attached to read the most promising scripts? Are they considered bona-fide by those already in the industry. Money is of course a nice ancillary benefit, and some competitions offer this in sums that appeal to that part of the writer’s brain that desires to make a living off writing one day. But just as valuable a prize can be mentorship schemes and industry recognition in the long run. It’s only that which will help launch your career. 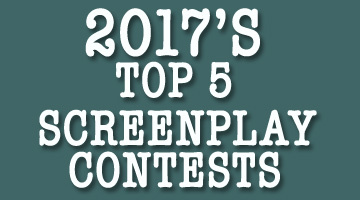 So here, in no particular order of quality, are our top five screenwriting contests for your consideration in 2017. Shore has a lineup of 35 Oscar, Golden Globe, Emmy, Bafta & Cannes award winning judges onboard to read each year’s winning Feature, TV Pilot and Short screenplays.Tony Grisoni and Jeremy Irons are two examples of their judges. They have the most distinguished judges of any screenwriting competition in the world. Shore also has a roster of 70+ international production companies, agents and managers who all receive the best scripts entered each year. This kind of prize is all about visibility, putting your work into the hands of those who can get it made. Keeping things simple, three main categories: Feature, TV Pilot and Shorts are open for writers to duke it out. This avoids the genre specific categories that fail to recognize the increase in genre cross-over scripts that don’t quite fit into one category. There is also a Short Film Fund that ensures the winning short script gets produced. 2016’s winner is currently in production in New York. When a screenwriting contest is connected to the Oscars you can guarantee that the kind of exposure winning contestants will get is more than just a flash in the pan. A look through the list of fellows might not throw up too many household names, but it does highlight a long list of notable writers who have made good careers for themselves in Hollywood, including Alison Anders, Jacob Estes and Ehren Kruger among many others. The Nicholl Fellowship is perhaps equally noted for its sizable largesse when it comes to prize money! At $35,000 for up to five writers each year, this is the most coveted prize in terms of both financial and career benefits. As such, it is also one of the most hotly contested and over-subscribed so scripts really have to be doing something very special to make it through. The competition, running since 1986, has just turned 30 years old and still going strong. 154 writers have benefitted from the fellowship so far. Exact dates for 2017 have yet to be released although going off past contests, the submission period is likely to run from mid-February to mid-May. Bluecat was started in 1998 by Gordy Hoffman, older brother of the late, great Philip Seymour Hoffman. The top cash prize in those days was $2,000, not too shabby for a starting competition. Today that prize has inflated to $15,000 for the winner and $2,500 for four finalists. It’s an attractive prize and with a shorts competition offering a $10,000 top prize it is easy to see why the contest remains a success. There are not many direct perks however in terms of getting your work out into the industry. While money is by far the main perk, of course bragging rights and the popularity of Bluecat within the industry are likely to ensure that announcing yourself a Bluecat winner is more than enough to get some attention, hence the ongoing importance of this award for writers. Exact dates for 2017 have yet to be released although based on previous contests; the first deadlines tend to land towards the end of June. By operating a rolling system of deadlines on account of their numerous competition categories, you could essentially submit to Screencraft a number of different times during the year. Categories include: Comedy, Sci-fi, Horror, TV Pilot, Family-friendly and more. The idea behind Screencraft’s contest is that the categories are tailored to be more specific, ensuring that the scripts are read by judges who specialize in that one genre. They have also launched their own Fellowship scheme which offers ongoing professional support and a trip to Los Angeles for key meetings with industry producers, agents and executives. Ongoing: Different categories have different submission periods and deadlines. The Fellowship scheme’s final deadline is January 15th 2017. Renowned as one of the biggest supporters of new and emerging filmmakers, Sundance Institute’s Labs offer some great opportunities. Aimed specifically at filmmakers and screenwriters with a unique vision, Sundance likes experimentation and risk taking to accompany solid character work and story-telling. If you think you fit that bill, then you could be following a similar path that have seen filmmakers like Quentin Tarantino and Andrea Arnold gain invaluable assistance, learning and gravitas to their work. The prize is a five day workshop with established writers and advisors. It is also a fantastic way to gain access to and attention from some of the best minds in the industry. Sundance is open to screenwriters from both the US and internationally, although the workshop takes place in Sundance Mountain Resort, Utah.